This demand has materialized into an increase in assets of around 250% for US liquid alternative mutual funds since Q3 2007. The relative explosion of assets in the space makes sense when examining the performance of various liquid alt indices during the financial crisis as well as the longer-term data relative to traditional assets or portfolios. Despite the perceived success of liquid alts as a growing asset class, they still face challenges. As we describe below, in addition to being new and potentially unproven, they also show signs of significant tracking error to their underlying indexes, are expensive, and can be hard for retail investors to sit through during bull markets. Let’s start by illustrating the appeal of liquid alts with some data. Figure 1 illustrates the performance of various sub-components of the liquid alt space during the financial crisis. As you can see, there is great variety when it comes to investments classified as liquid alts, but most of these sub-indices achieved the desired portfolio benefits outlined above when compared against traditional asset classes. Figure 2 outlines a longer-term view of performance (20 years) for the Credit Suisse Liquid Alternative index (CS index) against a traditional 60/40 portfolio of stocks and bonds. The Credit Suisse index seeks to represent the aggregate risk and return characteristics of a diversified universe of hedge funds using liquid, tradable instruments. The longer-term performance data is impressive given the less significant drawdown, lower volatility, and a much greater risk-adjusted return, per the Sharpe Ratio. Additionally, the CS index has only a moderate correlation to the S&P 500 which has historically benefited otherwise traditionally-allocated portfolios. The Credit Suisse index was not actually investible until 2012. Even now, available in an institutional share class mutual fund, the CS index has less than $100M in assets and contains a minimum investment of $250K which makes it generally inaccessible to most advisory clients as a 10-20% allocation. So, how does the Credit Suisse index compare to liquid alternatives funds that investors can more easily access? Figure 3 compares the performance of the Credit Suisse index and the S&P 500 to the IQ Hedge Multi-Strategy Tracker ETF (QAI), which, as of February ’19, is the largest Alternatives ETF according to ETF Database. As shown in the Figure 3 above, the investible multi-strategy ETF, QAI, has significantly underperformed the Credit Suisse index on both an absolute and risk-adjusted basis since the ETF’s inception. This disparity is significant for a few reasons. First, as advisors and institutions run historical simulations to gauge the portfolio effects of adding liquid alts to their portfolios, their investment expectations will be skewed by the longer-term index data given that the index outperforms an investable counterpart by such a wide margin. A second but related fact is the potential behavior-gap experienced by the investor who adds these historically inferior (vs. the index) strategies to their portfolio, given the likely difference between the back-test and reality. Based on this seemingly small data disparity, an entire asset class may be unduly discarded, making the goal of greater portfolio diversification less likely to be achieved (e.g. Managed Futures). Accordingly, for the balance of our analysis we will examine liquid alternatives through the investible QAI ETF rather than the non-investible Credit Suisse index. Another consideration as to the “investibility” of liquid alts concerns the advisor’s ability to explain and articulate the strategy and underlying holdings of the instrument being utilized. Many investors are likely unacquainted with the types of assets and strategies to which liquid alt portfolios are exposed. For instance, most traditional advisory offerings do not typically employ opaque or esoteric strategies. Additionally, it is not always easy to determine what assets these funds are holding or the rationale for their decisions. Perhaps one of the largest biases we see from investors in the liquid alt space is the inability to hold low or non-correlated assets during bull markets. In fact, this is the single biggest complaint we hear about alternatives. Granted, this is textbook bull market behavior. However, it’s impossible for advisors and investors to realize the value of having an alternative return stream in a portfolio if the tool used to deliver the exposure is constantly being sold due to its lack of correlation with traditional asset classes that seemingly make new all-time highs on a weekly basis! The old adage “trade the market you have, not the market you want” comes to mind. For example, to the left below is the 18-month rolling correlation between QAI and SPY. In this case, the formerly steady relationship began declining in ’16 continued to do so throughout most of ’17 while domestic equity markets soared. This is a tough pill for investors to swallow in a bull market for stocks. Furthermore, alternatives failed to provide adequate diversification in ‘18, with correlation spiking to nearly 1.0 as domestic equity markets plummeted. You can see a similar behavior in the graph on the right which depicts the same rolling correlation to SPY but uses a sample of liquid sub-indices instead of QAI. Except for Managed Futures, each of the indices are experiencing flat to increasing correlation to equities over the past 12 to 18 months while equity volatility has increased, and the S&P has experienced a 20% drawdown. We at Blueprint propose an alternative to liquid alts: Blueprint Growth. In contrast to expensive liquid alt mutual funds and ETFs, our Growth strategy has a maximum combined expense ratio and management fee of 61 basis points. Similarly, the strategy utilizes 8 familiar asset classes: US Equities, Foreign Developed Equities, Emerging Markets Equities, Real Estate, US Treasury Bonds, Inflation Protected Bonds, International Treasury Bonds, and even Managed Futures and Alternatives. We maintain daily liquidity, make systematic asset allocation decisions monthly, and are wholly transparent about our decision making. Click here to learn more about the Blueprint investment process. To begin, let’s look at a comparison of Blueprint Growth to QAI. As the Figure 6 above shows, Blueprint Growth demonstrates better absolute and risk-adjusted returns against QAI while maintaining a high cross-correlation of 0.73 over the sample. In isolation, liquid alts seem to be a strong investment and to have historically acted as an effective diversifier inside of a portfolio, but how does an otherwise diversified portfolio perform using Blueprint Growth as a substitute for a liquid alt allocation? By constructing a portfolio allocated 50% to the Vanguard Total Stock Market Index fund (VGMFX), 30% to Vanguard Total Bond Market Index Fund (VBMFX), and 20% to Blueprint Growth, and comparing performance to a portfolio comprised of the same configuration but using QAI instead of Blueprint Growth, we can better examine the potential relative effects of an Alternative to liquid alts. As shown in Figure 7 below, the portfolio with the 20% allocation to Blueprint Growth outperforms the portfolio with the 20% allocation to QAI on both an absolute and risk-adjusted basis. The liquid alternatives space has seen a massive influx of assets in the wake of investor uncertainty in the last 10 years, during which time the market experienced two historic drawdowns. Liquid alternatives can provide many benefits to an otherwise traditional portfolio, including diversification, less severe drawdowns and better risk-adjusted returns. However, and perhaps more importantly, many of the currently investible vehicles have not been truly tested in a dramatic drawdown environment like 2008. Despite the benefits of liquid alternatives, they can be costly, opaque and uncomfortable for retail investors to hold. The Blueprint Growth strategy demonstrates common attributes to liquid alternatives, including similar market correlation and drawdown profiles, but has achieved greater risk-adjusted returns at a reduced cost. 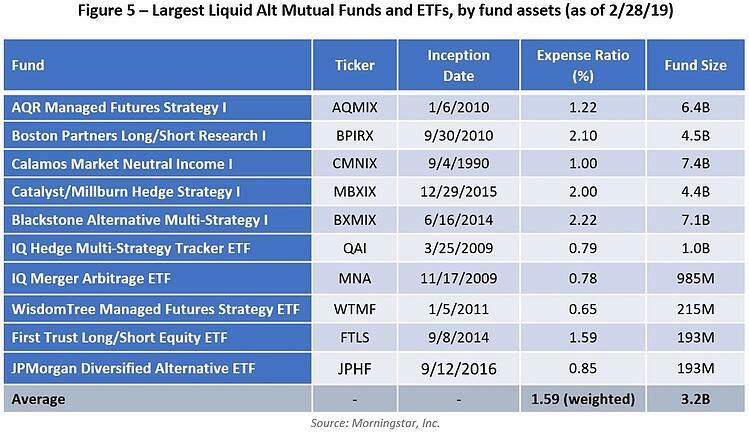 By overlaying trend following techniques to a familiar, traditionally-diversified portfolio of ETFs and/or mutual funds, Blueprint attempts to create the portfolio attributes that many liquid alt users are seeking. Additionally, it is an explainable strategy with time tested characteristics. Advisors seeking the diversifying qualities of liquid alternatives should consider utilizing the Blueprint Growth strategy in varying degrees from a dedicated portfolio sleeve to a full portfolio allocation, depending upon client objectives. Editor’s Note: This post was originally published in October 2017 and has been completely revamped and updated for accuracy and comprehensiveness. This website and the data herein is not a solicitation to invest in any investment product nor is it intended to provide investment advice. It is intended for information purposes only and should be used by investment professionals and investors who are knowledgeable of the risks involved. No representation is made that any investment will or is likely to achieve results comparable to those shown or will make any profit at all or will be able to avoid incurring substantial losses. While every effort has been made to provide data from sources considered to be reliable, no guarantee of accuracy is given. Historical data are presented for informational purposes only. Investment programs described herein contain significant risks. A secondary market may not exist or develop for some investments portrayed. Past performance is not indicative of future performance. Investment decisions should be made based on the investors specific financial needs and objectives, goals, time horizon, tax liability, risk tolerance and other relevant factors. Investments involve risk and unless otherwise stated, are not guaranteed. Be sure to first consult with a qualified financial adviser and/or tax professional before implementing any strategy discussed herein. Investors should consider the underlying funds’ investment objectives, risks, charges and expenses carefully before investing. The Advisor’s ADV, which contains this and other important information, should be read carefully before investing. ETFs trade like stocks and may trade for less than their net asset value. Blueprint Investment Partners, LLC (“Blueprint” or the “Advisor”) is registered as an investment adviser with the United States Securities and Exchange Commission (SEC). Registration does not constitute an endorsement of the firm by the SEC nor does it indicate that the Adviser has attained a particular level of skill or ability. Indexes are unmanaged and do not incur management fees, costs, and expenses. Blueprint’s risk-management process includes an effort to monitor and manage risk, but should not be confused with and does not imply low risk or the ability to control risk. There are risks associated with any investment approach, and Blueprint strategies have their own set of risks to be aware of. First, there are the risks associated with the long-term strategic holdings for each of the strategies. The more aggressive the Blueprint strategy selected, the more likely the strategy will contain larger weights in riskier asset classes, such as equities. Second, there are distinct risks associated with Blueprint Strategies’ shorter-term tactical allocations, which can result in more concentration towards a certain asset class or classes. This introduces the risk that Blueprint could be on the wrong side of a tactical over-weight, thus resulting in a drag on overall performance or loss of principal. PAST PERFORMANCE DOES NOT GUARANTEE FUTURE RESULTS. THIS DOCUMENT HAS BEEN PROVIDED TO YOU SOLELY FOR INFORMATION PURPOSES AND DOES NOT CONSTITUTE AN OFFER OR SOLICITATION OF AN OFFER OR ANY ADVICE OR RECOMMENDATION TO PURCHASE ANY SECURITIES OR OTHER FINANCIAL INSTRUMENTS AND MAY NOT BE CONSTRUED AS SUCH. THE INVESTMENT STRATEGY AND THEMES DISCUSSED HEREIN MAY BE UNSUITABLE FOR INVESTORS DEPENDING ON THEIR SPECIFIC INVESTMENT OBJECTIVES AND FINANCIAL SITUATION. DIVERSIFICATION DOES NOT ELIMINATE THE RISK OF EXPERIENCING INVESTMENT LOSSES. PLEASE NOTE THAT CHANGES IN THE RATE OF EXCHANGE OF A CURRENCY MAY AFFECT THE VALUE, PRICE OR INCOME OF AN INVESTMENT ADVERSELY. THE FACTUAL INFORMATION SET FORTH HEREIN HAS BEEN OBTAINED OR DERIVED FROM SOURCES BELIEVED BY THE AUTHOR AND BLUEPRINT INVESTMENT PARTNERS LLC (“BLUEPRINT”) TO BE RELIABLE BUT IT IS NOT NECESSARILY ALL-INCLUSIVE AND IS NOT GUARANTEED AS TO ITS ACCURACY AND IS NOT TO BE REGARDED AS A REPRESENTATION OR WARRANTY, EXPRESS OR IMPLIED, AS TO THE INFORMATION’S ACCURACY OR COMPLETENESS, NOR SHOULD THE ATTACHED INFORMATION SERVE AS THE BASIS OF ANY INVESTMENT DECISION. THE INFORMATION CONTAINED ON THIRD PARTY WEBSITES THAT BLUEPRINT INVESTMENT PARTNERS LLC (“BLUEPRINT”) MAY LINK TO ARE NOT REVIEWED IN THEIR ENTIRETY FOR ACCURACY AND BLUEPRINT ASSUMES NO LIABILITY FOR THE INFORMATION CONTAINED ON THESE WEBSITES. NO PART OF THIS MATERIAL MAY BE REPRODUCED IN ANY form OR REFERRED TO IN ANY OTHER PUBLICATION, WITHOUT EXPRESS WRITTEN PERMISSION FROM BLUEPRINT.